Congrats on making the Longlist! 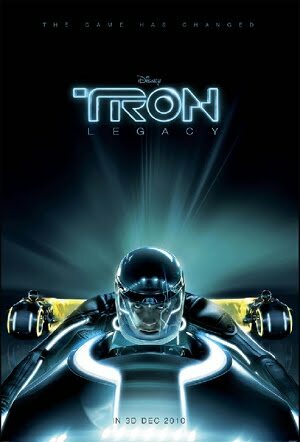 I'm really excited about seeing Tron Legacy; I just hope that all this snow melts soon so I can go see it! Happy to hear you made the list! I'm sure there is more to come for you. I wasn't very excited about the movie, but I've seen a couple of good reviews today. So I've changed my mind! Thanks for that. WOW! You made THE LIST, regardless if it's the long one, that is spectacular news!!! Be proud and excited! Good for you! And, I'm so happy you liked Tron. I've been looking forward to it, but wasn't sure after reading some reviews. Think I'll go. Congratulations!!!!! That's awesome and I can't wait to hear you've made the short list. I believe! Um, keep an eye on the tribbles and Nine seems to be missing....you know anything about that? Well, I don't think the original Tron was very well received by the critics too and it has turned legendary. I am glad you liked it. I need to see it in theaters when I can get the 3D effect. Two of my sons are at the theater right now to see it. I wonder if they'll agree. They go see anything fantasy or scifi. I wasn't planning on seeing it but if they agree with you I might have to go. OMG, did you really like it that much, Alex? The weird thing is, I hate T:L before I've even seen it. The trailer annoyed me to death - it's full of laughably ridiculous dialogues and stiff acting. thanks for the review and as always, loved the Christmas Stardates. Where do you find these? Or did you make them up? Congrats on making the list! I haven't seen the first Tron movie, but this one looks really cool. It's something my husband and I would love to go to. Glad you liked it! Congratulations, Alex, on making the list! Woo-hoo! Jamie, saw some images from Europe - you guys really got some snow! Pat, even if the story doesn't wow you, the eye candy will. Dezz, I know they've entered me in a few others. No idea which ones though! Terry, thank you. Just go see Tron! Reviewers are being SO harsh, and it's a fun movie. 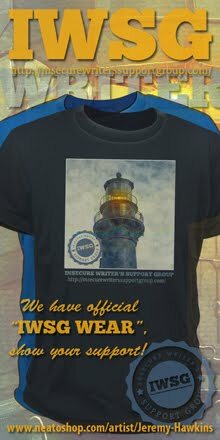 Words Crafter - I'll send Worf out to find them both right away! And thanks for your vote of confidence. Cheeseboy, you HAVE to see it in 3D. Nebular, lower your expectations (I did) and just go expecting eye candy only. I was SO surprised when it was far better than I'd imagined. The more I think about it, the more I liked it. May have to see it a second time! mshatch - totally from the mind of Captain Ninja Alex! Len, I think you'll be 'wowed' by it all! Also, I'm super jealous that you've seen Tron. I as soon as I can, I'm going to the theater. It looks amazing and just as fun as the first one. I'm not a trekkie by any means, but I live for your stardate updates! Crack me up every time. that's awesome about making the longlist!!!!! and i love your stardate posts so much! Awesome on the long list. Keeping my fingers crossed for you. I think the one thing that can be agreed is the spectacular CG effects, it's one of the best I've seen so far this year. I think I know what the critics took issue with, but this film is worth a try just for the visual treat itself. That's so cool that you made the list! Congratulations! I'll have my fingers crossed for you. Glad you liked Tron. I just saw another trailer for it and it whetted my appetite. I do agree that the effects used to reduce Jeff Bridges' age seem a little odd. But it does look like it worked in that world. Damn Cool post; Congrats on the long list! My son is going Monday to see Tron. It is college break and a day off from work. I have a feeling, he will agree with your review! Congrats on the list, awesome to read. Congratulations on making the list. You should be proud. Congrats on the Lit Awards list! We saw Tron and I really enjoyed it. Much better than the first one. Glad you enjoyed Tron so much Alex. I still cannot get excited enough to go and see it. It's just not working. Dempsey, it's not great, but it is fun and a visual feast. Vicki thank you - glad you enjoy them! J-Son, you're right, and it's certainly better than Transformers II. Robin, I like the football analogy. Jai, that kind of effect is still not quite there yet. Jeremy, good to hear you enjoyed it as well! Bryan, if you do, be sure to see it in 3D - this one is a must in 3D. Aarrgghh! I decided not to go see Tron:Legacy today, looks like I made a mistake. YES that is incredibly cool!!!! Congratulations! That's an awesome early Christmas present. Congrats Alex for making the list on the Indie Lit Awards! You should be mighty proud of yourself. May your book sales in 2011 be bountiful. I made mention of CassaStar on my last blog post for the year. Ricky, there's still time before Christmas! And you, Wendy! I'll go check that out. I will definitely see Tron. 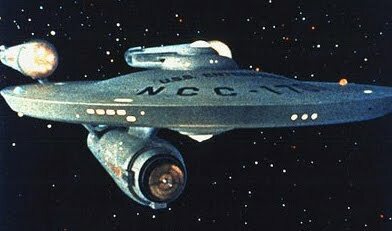 And am always game for anythign STar Trek. Good deal on the long list. I'd wondered about Tron. I'm so old I saw the first one in the theater. I don't get out to the theaters anymore, so this one will have to wait for either DVD release or pay-per-view. Thanks for the Tron review. We're going to see it this week. Yeah, photon torpedoes can really ruin someone's day. Huge Congrats on making the list!!! :) That's wonderful news! Charles, hope my updates amuse you then! Randy, I saw the first one in the theater as well! Thanks everyone - I'm sure CassaStar won't make the short list, but hey, you never know! Congratulations on your nomination! Great review of Tron. I admit, I'm definitely curious about seeing it. I promise to come back and read your Tron review once I see it later this week. Good news on Cassastar too! Congratulations Alex! I'm crossing my fingers for you. But for the movie, I don't think I'll see it. Don't like JB that much, after he knocked Colin Firth off the oscar best actor list last year. I saw Tron over the weekend, too, and I enjoyed it. Sure, the story was predictable, but the special effects, soundtrack and overall experience were a BLAST! I had a great time with it! Went to see Tron in 3D on Saturday. I really enjoyed it. Sometimes a movie needs to be simply entertaining, but I think critics want it to be some groundbreaking work of filmography. Whatever. It was fun. Congratz on making the list! Shannon, glad you enjoyed it! No, it's not deep - just fun. Stephanie, I agree. Gosh, didn't those guys watch the first Tron? What were they expecting? Congrats on making the long list!! that's fantastica! I will most def be seeing Tron. I loved the original and still do. Classic scifi. Well that is two positive reviews from people I follow. Hmmmm. 2 tibbles mating. LOL. Sorry, still got the giggles after reading Powdered Toast Man's question. Hannah, you let me know what you thought of it! Glad you like it, Lola! (And your husband has good taste.) Yes, wasn't the score amazing? Ellie, that makes me smile! 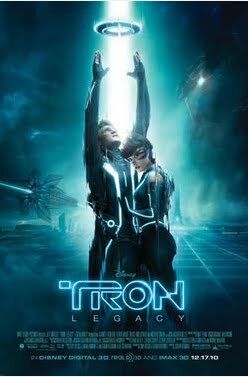 I'm really looking forward to Tron: Legacy. It looks exactly as you described it: like a whole lot of fun.